Around 3 or 4 months ago I started planning and booking my next large trip to Europe – I have a second child on the way (very soon, hence the less frequent posts recently!) and we’ll be taking them and our 3 year old over to visit family and friends. I figured writing up how I booked the trip with the costs and points involved would be useful to others with similar goals. After managing a full round the world in Business Class and Premium Economy for two of us, plus an infant, a couple of years back, I was determined to do the same this time – with the extra challenge of another person. Not only that, but there’s no way we wanted to do this trip in Economy if we could help it. With those constraints in mind I set about researching options, and I looked into using a mixture of Membership Rewards, Velocity, Qantas Frequent Flyer and Avios bookings to make these bookings. Redemption cost: 60,000 points per person, with myself booked as an Any Seat Award (before the changes last month). Out of pocket cost for my partner and daughter was $205 and $150 respectively and my ASA, $346. Total spent: 180,000 Qantas Frequent Flyer points and $701. This blew away my stash of Qantas Frequent Flyer points from work travel, spend and signup bonuses on my Bankwest, Woolworths and David Jones Amex credit cards, taking me down to a single digit balance in my Qantas account. There wasn’t much creative points earning to get that balance, just some work travel with Qantas, and credit card usage. I’ve flown Qantas to and from Hong Kong several times, while I was keen to try Virgin Atlantic or Cathay Pacific Business Class, the timings of the single daily Virgin flight and the lack of availability on Cathay Pacific (although normally pretty good) and increased cost (in points) made these no-go options. This was booked using a heap of British Airways Executive Club Avios that I had slowly been amassing over the last couple of years. I have an Executive Club family account for many family members in the UK, and have kept some credit history active with Amex since I left the UK 5+ years ago. 30,000 Avios were from Credit Card signup bonuses. There were also a couple of recent Accor promotions which earnt around 7,500 Avios per family member, plus a couple of Accor stays. These were transferred to Avios with British Airways via the Le Club to Iberia point multiplier, and then a transfer with avios.com, and repeated for each family member involved. All up, this took probably 1-2 hours per member to earn and manage these points – but well worth it. Finally, I bought another 30,000 from a recent Avios purchase promotion to get me over the line – 24,000 with a 6,000 point bonus for £399. The choice of Cathay’s new Premium Economy was a fairly simple one – I could have minimised the Avios needed by flying with British Airways, and on their new A380 too. However the needs of flying with a family overrode my desire to fly their new product, as British Airways bassinets are shockingly poorly designed (in my opinion), with a fold out table and picnic basket style design which makes it impossible to get a baby in and out smoothly. The result was enough noise and stress to make a previous British Airways Club World flight unbearable, both for us and our fellow passengers. Given that, and my great experience with Cathay’s Premium Economy earlier this year, it was an easy decision. My Amex Membership Rewards points are earn in a few key ways – firstly household spend, especially at supermarkets and on fuel with the Platinum Edge. Second – your amazing support by applying for American Express Membership Rewards cards through my referral posts. Thankyou! Finally, the most interesting – keeping an eye on American Express current Membership Rewards bonus promotions. I’ve used a few of these to clock up kickers of several thousand points, and I also received around 7 or 8 blocks of 5,000 points through MS Society donations, each at $150 (which is then tax deductible). Total cost (after factoring in the tax return) for these would be around $750. The choice of Malaysia Airlines from Paris was extremely straightforward – as I have said before, the cost (in points) for Malaysia Airlines redemptions between Europe and Australia just can’t be beat, at 51,000 Enrich miles per person. Yes, Enrich miles, Avios and Qantas Frequent Flyer points are all different currencies with therefore different perceived value from person to person, and you can’t compare them directly, but I will anyway. Note my previous redemption costs for the other flights on this trip – 60,000 Qantas points for Sydney to Hong Kong in Qantas Business Class. 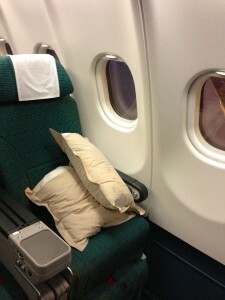 45,000 Avios for Hong Kong to London in Cathay Pacific Premium Economy. And just 51,000 Enrich miles for the whole trip from Paris to Sydney in Business Class? That’s just ridiculous. Malaysia Airlines Business Class is a cut below that from Qantas, Cathay Pacific, Singapore Airlines and the like, but the price for easily accessible Business Class redemptions is significantly lower too, and given this redemption is on their relatively new A380 and A330 products, it’s definitely a great use of your points. Three people to Europe and back in Business Class (OK, one flight in Premium Economy) for $4,000? That’s what points are all about. All of these flights have been booked for 2 adults and a child (3 seats) as our new family member is yet to show their face. As soon as the new one is born, in the weeks after I’ll try and struggle through my sleep-deprived haze to call Qantas, British Airways and Malaysia Airlines to get them to add the infant to our bookings and get bassinet seats assigned. For Qantas and Malaysia Airlines this will be as simple as paying the additional taxes. For British Airways, I’ll also have to fork out 4,500 Avios for the infant, as they charge 10% of the adult fare in points as well. I hate that rule. Program diversification – not putting all your points in one basket. Take advantage of promotions – keeping abreast of what’s going on, and using promotions to earn points for future use. Know what points are worth to you – I bought those British Airways points and made the donations to receive the bonus Membership Rewards points because I knew I would yield more value from them than the cost I laid out. Using credit card bonuses, but sparingly – over the course of around 18 months, I signed up for no more than 3 new cards – and did so knowing that I would have a very good chance of being approved as I had no other recent applications on my credit record. I will, of course, review all of these flights and a few hotels we stay in along the way. If you have any points blowout experiences, share them in the comments! How did adding the infant on Malaysia go? was it as simple as paying the taxes? Or was it 10% of the full business class fare? Straightforward generally – had to be super clear about what I was asking for over the phone, but got there eventually and it was just taxes only, not 10% of the fare. Would have been easier to book online at time of main booking but not possible given newborn wasn’t out yet! And thanks for the inspiration, planning to do a similar points trip next year. Will only have the points after the birth, but good to know. Don’t say that! Any tips? lots of small presents on the plane? The flying isn’t hard if you’re not in Economy. While we’re not a TV mad family, the IFE got a massive workout plus snacks, toys, nothing unexpected really. We’ve found the jetlag recovery is the killer for the kids, and therefore the parents, took 4 or 5 days to get on top of the change from HK to the UK. It doesn’t look like you can do enrich redemptions with an infant online? So is the only way to redeem and then ring to add the infant (and pay the taxes)? Yep, not too hard to do though, just takes time – about 30m from memory and that was one booking only. Do banks really share data on and track your credit card application frequency? I’ve read conflicting stories. On the one hand I’ve read that having lots of credit cards is good, because your total credit limit is high and therefore it follows that your credit history is good if you’re able to secure so much credit. On the other hand, there is your view which argues that banks are wary of credit card “churners” and signing up too many is a red flag that can affect your credit record. Do you know what the truth is? I’ll preface this by saying ‘I am not an expert at understanding credit records, and have nothing but personal experience to comment on’. You (or a bank) can pull your credit file when you apply for credit, you can get a copy any time. This file shows what applications for credit, not just cards, you have made over many years, amongst other things like defaults or missed payments. It shows the institution you applied with and the date, but little more. AFAIK, it doesn’t show which banks you have an active relationship with. You can imagine though that some application processes would check how many times you have applied for credit recently and use this as an indicator of your credit worthiness, and I have had a few applications turned down for unknown reasons, when the only one I can think of is a recent other application. Everyone’s situation is different though. Great read & congrats for the baby on the way! MH points are such great value for redemptions. Would you happen to know the amount of points needed for a Y->J upgrade with MH? Just wondering if that is a good value use of points. I haven’t looked into MH upgrades much, other than I think you have to call. AFAIK there’s no pricing online. Great article and thanks for the tips. Was wondering why you hadn’t been positing much lately but having a baby on the way is a fair excuse!